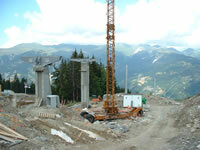 A new high speed detachable 6-seater chairlift from 1550 to 1850 is being constructed. The new lift exits in front of Le Forum - handy for a quick drink in the Kalico! The new chairlift replaces the ancient fixed 2-seater Dou du Midi chair lift and the vicious Tovets drag lift - It should all be installed and ready for Winter 2004/5. 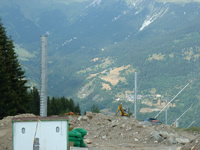 The mini ski jump has been removed too and an additional mini jump has been built on the Olympic Ski Jump at Le Praz. Piste improvements to the track down to the Plantrey lift have been made to help with the extra traffic this lift will generate. Along with all the other drainage and erosion prevention work there's also been improvements on the off-piste itinerary run from Le Praz to St Bon and more work on the beginners area at 1850 with the shortening of the Etoiles drag lift and a new first timers lift being installed. There's a new snow cannon reservoir being built up near the Signal 6-seater lift at 1650 too. The Plan de l'homme chair from the Chaudanne in Meribel is being replaced by a high speed detachable 6 seater chairlift. This will gives access to Tougnete 2, the Olympic Chair, the long Cherferie drag to the ridge above St Martin and there'll be a new piste directly down to the Moon Park too. This new lift should certainly reduce the queues around Tougnette at peak times. The route of the new 6 seater lift to the right of the pics - no pylons yet! Piste improvements include work on the Pic Noir and it looks like new snow cannons are being placed on this black piste down towards Meribel Village. Work on the path down to the Chaudanne and over on the routes around the Mont Vallon area are also in progress. A new escalator near the Tourist Office is also being constructed. A new 6 seater chair replaces the Grand Lac and Choumes long drag lifts making an easier route between St Martin de Belleville and Les Menuires. The new lift will be called Les Granges and looks like it will have a cover like the Mont de la Chambre lift. 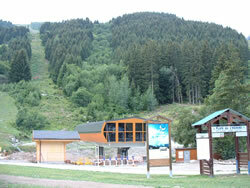 There's more new snow cannons on the Allemandes piste and a new snow park in the Combes-Beca area. Hopefully the Funitel Peclet will be fully repaired now. There was no skiing in Val Thorens this summer because of maintenance work on the Funitel lift which was damaged in a "controlled" avalanche in February - set off by Pisteurs making runs safe! 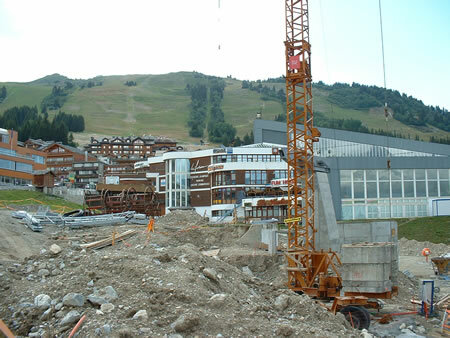 A new restaurant is being built at the bottom of the new Les Granges chair lift and a new apartment / chalet complex is being built in Les Menuires named Le Hameau des Airelles. The very old short drag lift in Saint Martin (rumoured to be the oldest lift in The Three Valleys) is to be replaced by a new Poma drag - the will certainly be a lot more comfortable start after lunch at Brewskis! 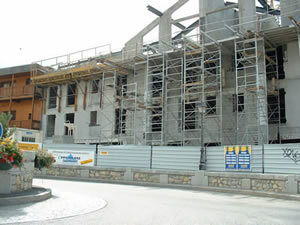 The former La Tania Chalet Hotel (Chalet du Sud) is to re-open as Hotel Telemark this Winter. Run by The Mountain Centre team it has en-suite doubles, a bar and bistro style restaurant. Also in La Tania we've 3 new chalets going up next to the piste half-way up the Troika built in to the steep bank at the edge of the forest. 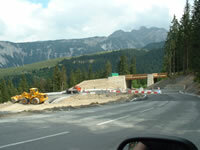 Access will still be allowed to the piste from the road above - see on the extreme left of the new webcam below. The Signal Bar and Hotel is having a complete rebuild/refurb. This infamous Mutzig (very strong "old" lager) hostelry will be back open for Winter 2004/5. Finally a new webcam for La Tania which should prove more reliable than the last one. 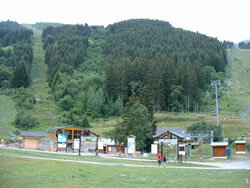 It overlooks the Troika beginners lift on the main piste running through La Tania and up towards the Col de la Loze. Set to take pics 3 times a day at the moment - more if someone sponsors it!